to give Tim Foster a much-needed rest – although, who am I kidding? I still had to look to him for guidance at every turn. If you haven’t met Foster (or Ol’ Man Foster, as many of us call him), there’s far too much to say about this garage band-fronting, clown car-collecting, Fleetwood Mac-hating, lavender pants-wearing, Bud’s Buffet-loving ball of contradictions than I can get into here. Suffice to say that when it comes to editing MidMo, Foster is a perfect combination of laid back and uncompromising: yet another contradiction, but one that works for all of us. 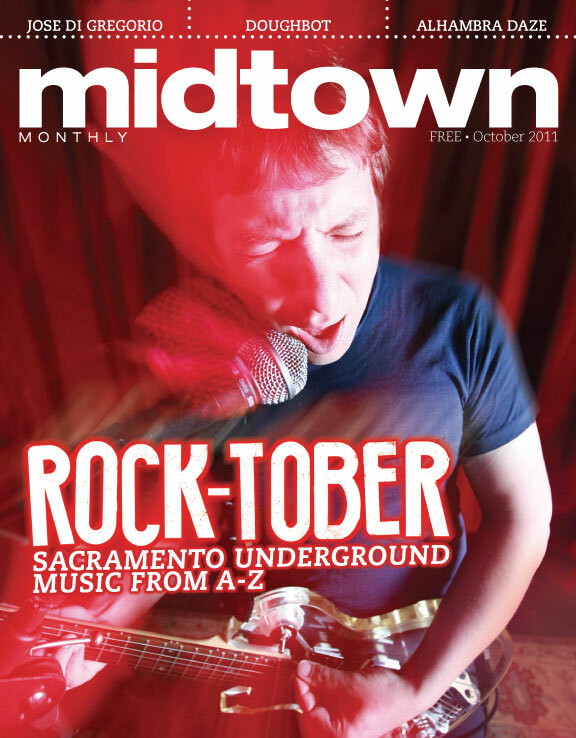 Yes, Rock-tober is a silly theme – it was generated out of a desire to spare you yet another Halloween-themed issue – but contributor Dennis Yudt took this vague theme and generated a tour-de-force on Sacramento underground music that is a heckuva lot of fun to read. Reading his guide brought up a lot of wonderful memories for me, especially the entry on the Loft vs. Old Ironsides (or as I remember it, Loft vs. Cattle Club) days. Indulge me in a brief, early ‘90s story: in my late teens and early twenties, I used to travel from my small, hick-ish hometown to the Cattle Club (a 45 minute journey to literally the only destination I had memorized in Sacramento), hence, I initially fell firmly on the side of the Cattle Club. There was even a Loft scene-generated zine called Alphabet Threat that stoked the fires of the feud! One weekend, I heard tell of an upcoming Bikini Kill show at the Loft, and I knew that this “secret” venue was behind a bookstore, so I dutifully showed up at Levinson’s Books (later the home of Temple Coffee) hoping to catch my Riot Grrrl idols. Sadly, I had guessed wrong – the real Loft was behind Time Tested Books and I missed the show. Later, I infiltrated the Loft milieu and saw Nar, the Lil Bunnies and Tiger Trap, among many others. Yudt’s piece brought it all flooding back. On a more current note, Dennis’ “A” entry fittingly has a slot for Charles Albright, our cover star. This veteran of countless local bands, Sac scene macher (look it up), and all around best guy (ask anyone) has really been blowing up this year. It’s been crazy to go to the Vice Mag contents page online (as I am wont to do) and see Albright’s mug front and center. He’s a fine young man and he’s doing so well. Other music-related pieces in this de-facto music issue include Tony King’s article on “polyrhythmic dance pop” group Favors, Guphy’s piece on Sacramento’s country music history (who knew we had a history, let alone one that included a monkey and a donkey?) and Bill Burg’s goosebump-inducing photo essay on the ultimately unsuccessful benefit concerts to save the Alhambra Theater. As tragic as the loss of the Alhambra is (I feel it acutely, even though it occurred shortly before I was born), it galvanized a generation and we are still feeling the reverberations today. Never forget! In addition to guest-editing, I had the privilege of profiling artist Jose di Gregorio this month, as well as revisiting some restaurant locations that I’ve reviewed before in my five year (!) tenure at MidMo. Di Gregorio first came to my attention when he good-naturedly posed for the cover of our Old Sac issue (May 2011), and next when two friends who don’t pay much attention to the art scene in Sac independently told me that he was the one artist who had caught their eye. Who was this jauntily mustachioed artist who was suddenly everywhere I turned? I had to know, and now you will too. 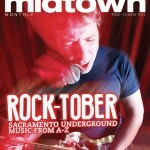 All this, in addition to our solid-as-a-rock wine picks, Musical Chairs, SML, Eats on the Street, and the ever-enigmatic Sactorialist, have made editing our “Rock-tober” issue a pleasure. One I hope to duplicate. Once a year at the most.